Welcome to Stuart-Arts Bike Car Lights Home Page! Scott Stuart's latest invention! Soon to be available for purchase in 2009! 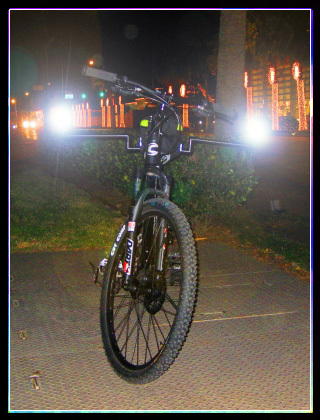 Bike Car Lights will broaden your profile on the road and make you appear larger and more visible at night like a car. 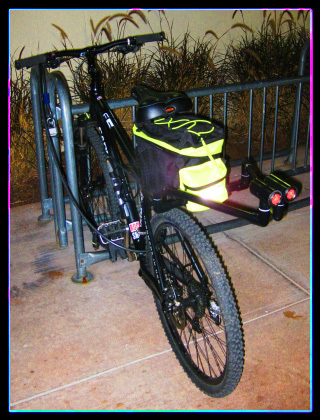 The maximum width of the original Bike Car Lights is 40", and the width is easily adjustable. You will have a switch for left and right turn signal blinkers. You will also have a Flashing Tail Lights option. 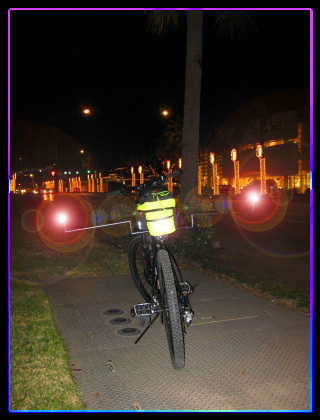 At night, it is tough to see a bike using 'old school' lights and hand signaling. 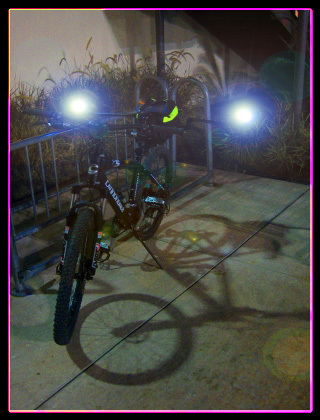 With Bike Car Lights you will enjoy the same safety lighting as cars do. Bike Car Lights are a must have for the safety conscious! They could save your life or the life of a loved one. You can fold either arm forward or backward. You can ride with the arms in a straight line (for maximum width), a forward or backward V shape, or in a pulled back or pulled forward tucked under the seat position (trail and storage position). Each Bike Car Light arm and headlight is independently multi-directional. You can point the headlights in or out, up or down! Bike Car Lights utilize LED technology! LED lighting is 90% More Efficient than traditional lighting. They are Heat Free Technology, and they have a 10,000 Hour Life. With each headlight consisting of 9 bulbs, this will dramatically improve visibility for yourself as well as for others to see you. Battery Powered With Optional Generator Inputs. Call Scott Stuart at 713-206-4012 for more information or for a quote on a new one for yourself or a loved one! We plan for our products to be "Made In The USA". Manufacturers are welcome to contact me. This website was created by Dana and Scott Stuart of Stuart-Arts.com. Copyright 1999-2999.